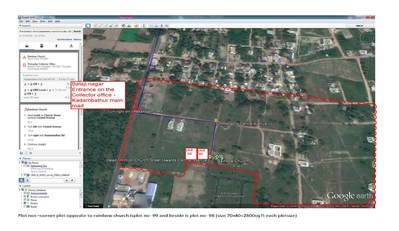 Residential Plot no-99 located in the Balaji nagar on the main road of Tiruvallur collector office to kadambatur Main road, (6km from Collectorate and 2 km from Kadambatur EMU railway station. All basic amenities are available at the strategic location of the plot such as Police station, petrol bunk, School, Railway stn, Bus stand, Engg colleges, , Temples, Churches and large integrated township SUN CITY. Balaji nagar was recently developed , DTCP approved , clear document/sale deed with patta available. As per GO of Tamilnadu dt jan'2018, Balaji nagar now comes under Extended Chennai metropolitan city .Being the prime location, Thiruvallur city development being taking place in this area fast and houses are already built and occupied by the owners including farm house with swimming pool, Church, Parks etc. Recently Chennai silks and State Government offices including collectorate, SP office are located in approachable distance. drinking Water Quality is very good and available within short depth. ready to move and construct the houses .Potential property for investment for short as well as long term for high return. Around the plot fencing area , Builders &developers already constructed and sold the houses. Registration and other cost should be born by buyer.